Heath grew up the son of a pastor at churches in West Virginia and Virginia. He attended Va Tech and received BS and MS degrees in Electrical Engineering. Since 2001, he has worked for an engineering company in the NRV where he currently serves on the site leadership team. Heath and Penny have been married for over 20 years and have 5 children in elementary and middle school. 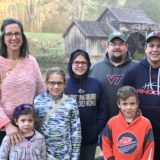 (Logan, Leah, Anna, Brady, Marlie) Heath has a passion for ensuring the church body is empowered to be as effective as possible in achieving its mission.